All of my colonies were in hard shape this spring. Maybe that has something to do with it. Only in the past couple of weeks have I noticed bees even walking around the bottom entrances. They’re down there now, but I think they might be nurse bees hanging off the bottom of some brood frames, just sort of hanging outside to take a break from nursing duties for a few minutes. They’re not fanning. They don’t behave agitated like guard bees. They’re not foragers. There’s just a dozen bees, or even less, sitting around the bottom entrance not doing much of anything. Is that a swarm sign? You got me. But I hope it’s nothing. Despite having kept bees since 2010, this my first summer in a long time that I’ve been able to spend almost every day observing my bees closely. Much of what I’m kind of worried about is probably similar to what first and second year beekeepers would experience from looking at something they’ve never seen before, wondering if it’s normal or if it’s something gone awry. I remember what it was like during my first year. Everything had me worried. Yup, this feeling is bringing me back. Just to be safe, or paranoid, I decided to add another honey super full of drawn comb to this hive to relieve some of the congestion. I even drilled a hole in the honey super. Again, they’ll probably ignore the hole, but it’s there if they want to use it. The yellow honey super is the new one with the hole in it. I was pleasantly surprised to feel the hefty weight of the first honey super (the green one on top). A heavy super is a good sign the bees are filling the frames with nectar. Maybe with FOUR ENTRANCES to choose from now, the bees won’t crowd the top entrance so much. Not that it’s anything to be concerned about… Right? P.S. : This is the same hive I posted about earlier today with the empty moisture quilt on top. UPDATE (the next day): Here’s a photo that shows signs of the brood nest in the bottom of the hive. Nurse bees hanging off frames of brood in the bottom of the hive. I’m curious to see what these bees do for the rest of the summer. It’s been too long since I’ve had the time to watch my bees so closely. Looking back on photos I post four and five years ago, I know I’ve seen all of this before. But it feels new to me again. UPDATE #2: It’s been cool today, so not much action around the hive. Most of the bees are still using the top entrance, but a slower but regular flow of bees are using the hole I drilled in the new honey super. Just to get them interested in it, I smeared some lemongrass oil inside the hole. I’m not sure if that made any difference, but they are using the hole now. The bottom entrance still have a small number of bees just sort of milling about. July 27, 2017: I slid the empty moisture quilt back to give the bees more room to come and goo because they were crowding the top entrance so much, most of them couldn’t get in. The last time I opened the top of a hive like this, all the bees turned mean on me. These are different bees, nicer bees, so I think (I hope) it doesn’t make them defensive. With a 30°C heat (86°F), even with the full ventilation through the empty moisture quilt, the bees seem okay with the extra ventilation. UPDATE (the next day): Opening the hive like this has caused the bees to become defensive. They’ve shown not a single sign of defensiveness for the past few months, even when I goofed up and squished several bees during an inspection (which usually releases alarm pheromones). They may be more defensive because they’re protecting their honey, but the large top entrance gives them a much larger area to guard — therefore more guard bees. I think that arguments holds. Warré may have made said something about it too. Sounds like something he’d say. Here’s a video of those bees where they can bee seen fanning the entrance — curing the nectar into honey. They did that well into the night. 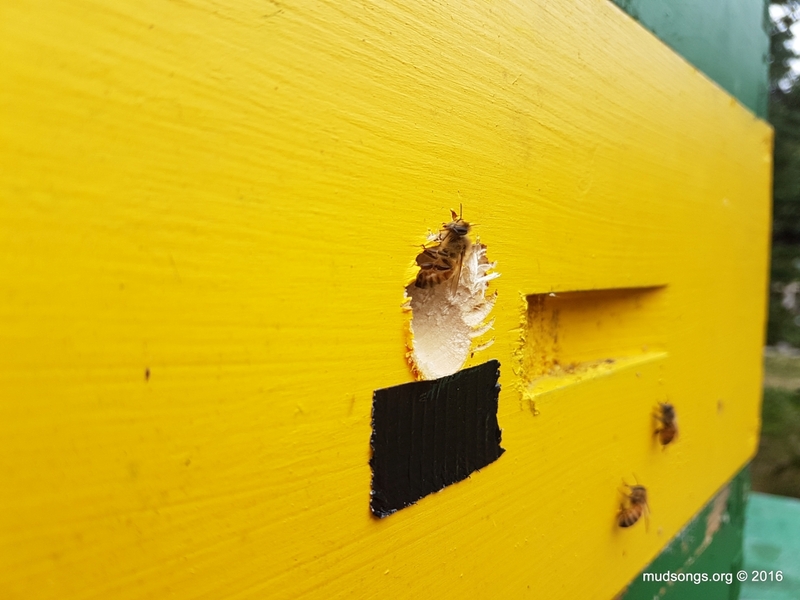 JULY 29, 2016: I’m not sure this post has anything to do with the bees not using the bottom entrance anymore — or the holes I’ve drilled in some of my supers. The bees will use whatever entrance is most convenient for them for whatever task they’re focused on. Maybe they enter from whatever entrance has the strongest scent of the queen’s pheromones. Maybe not. I’m not the person to definitively answer the question because I don’t yet have the experience to back it up. But just looking at what’s happened with all four of my colonies so far this year, I could have plugged up the bottom entrances completely and I doubt they would have missed it. It may have had an effect on the ventilation inside the hives, but as an entrance, it wouldn’t have made any difference. Only until very recently, say within the past 10 days or so, have any bees begun to show up near the bottom entrances. What’s interesting, though, is that they’re not using the bottom entrance to come and go. The bees are just sort of walking around the bottom board, not fanning or scenting or cleaning out dead bees. Nothing. Half the time they’re just sitting there. All my colonies were in sad shaping starting out the year. My guess is the queens in each hive, even after I reversed the brood nests, favoured the tops of the hives. Most of the fresh brood began near the top, not the bottom. 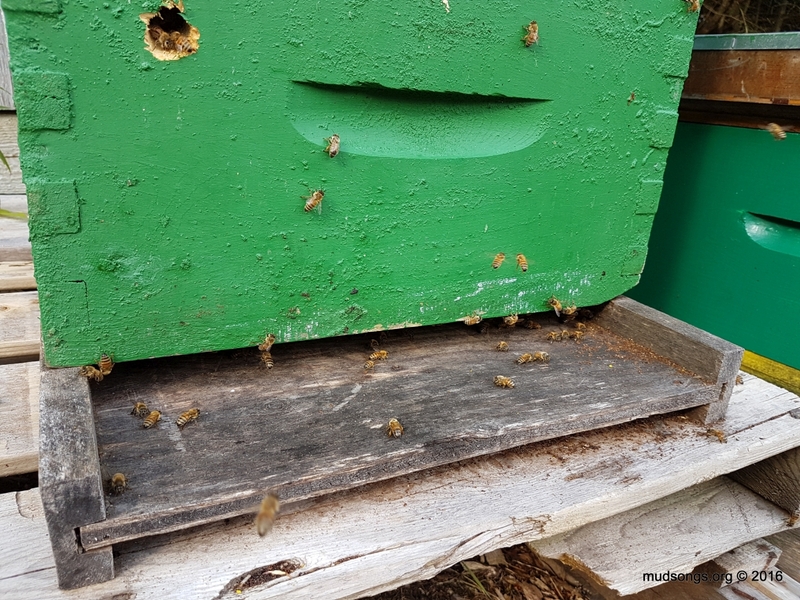 But now as the honey flow hits its peak and we’ve finally had some hot and humid weather for a few weeks, the tops of the hives are filling with honey, driving the brood nests down where some of the nurse bees are coming out the bottom, loitering around the bottom board. But really I don’t know. I haven’t been tearing the hives apart to see exactly what’s going on inside. I’m tempted to do away with bottom entrances altogether. Maybe keep some holes in the bottom deeps for ventilation, but forget about bottom entrances. I know it works for Michael Bush. I’ve never been convinced by his arguments. I’m not sure how only top entrances would work in my local climate which is probably more damp and cold than his. But I’m tempted. I always scrape clean the bottom boards during the first major inspection after the winter anyway, so perhaps the accumulation of dead bees and debris wouldn’t be an issue. I’ll probably never do it, but I’m tempted. At any rate, let’s get back to the hive that’s featured in this post. I pulled it apart yesterday for what I hope is the last major inspection and hive disruption of the summer, or even the year. If I didn’t have to concern myself with swarms that might potentially upset my neighbours, I probably wouldn’t have touched this hive. To be completely honest, if I kept my bees in an area nowhere near human habitation, I would probably perform full inspections of my hives at most twice a year. Back when I kept my bees on an isolated farm, I loved not having to concern myself with swarms. Not that I want my colonies to swarm, but it’s more relaxing when I know swarms won’t cause me any major stress — stress from other humans freaking out, which I’ve experienced with my neighbours from hell when I lived in the city, which is the reason why I now live in a more rural neighbourhood. I’m pretty sure this colony would have swarmed if I hadn’t inspected it yesterday, because holy moly, it was PACKED with brood. Of the 20 frames in the 2-deep hive, I’d guess that more than 10 of them were full of capped brood and another 4 or 5 frames of fresh brood, every cell on the frames filled. I found a couple frames loaded heavy with nothing but pollen and maybe, at the most, two frames of empty drawn comb, half a frame here, another half frame over there. It was a very tight hive, the majority of the frames full of capped brood. Maybe if I’d left everything alone, it would have worked out beautifully. Tens of thousands of bees emerging with the next few weeks, all of them going to work in the two honey supers. It could have been a honey-making machine. But I couldn’t risk a swarm. So I removed 3 frames of brood and a heavy frame of pollen and replaced those 4 frames with 3 frames of empty drawn comb and one foundationless frame, spacing them throughout both deep. So that’ll give the queen more space to lay and it’ll give the worker bees a foundationless frame they can fill with comb — all of which should be enough prevent the queen from becoming honey bound and to relieve congestion and generally knock back any swarming instinct from kicking in. I hope. Two medium supers (honey supers) full of empty drawn comb on top should further help relieve congestion, provide better ventilation of the queen’s pheromones throughout the hive and give the bees something to work on other than swarm cells. 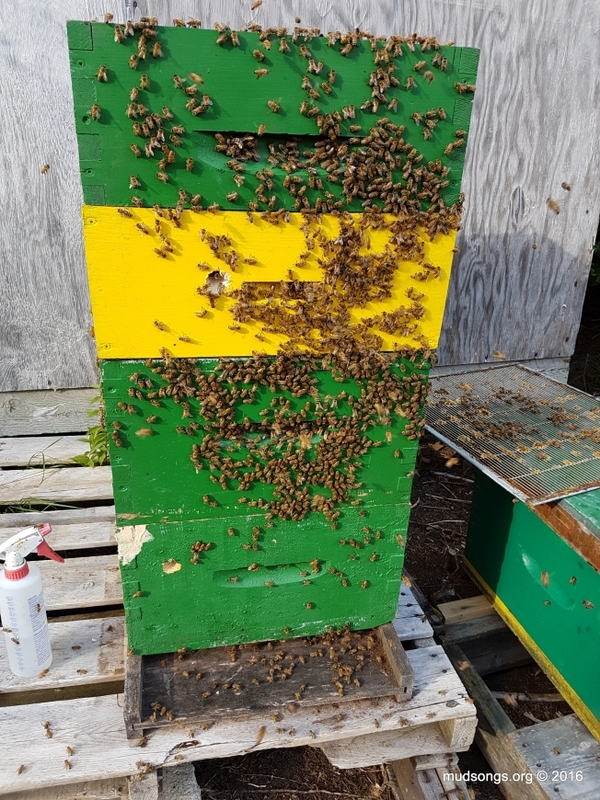 And now that I’m more confident this colony is unlikely to swarm, I have no plans to touch again until September or October, whenever I decide to remove the honey supers. So that gives the bees at least a full month to do whatever they want, with no chance of me messing up their business (unless I find another reason to mess with them, which I probably will). 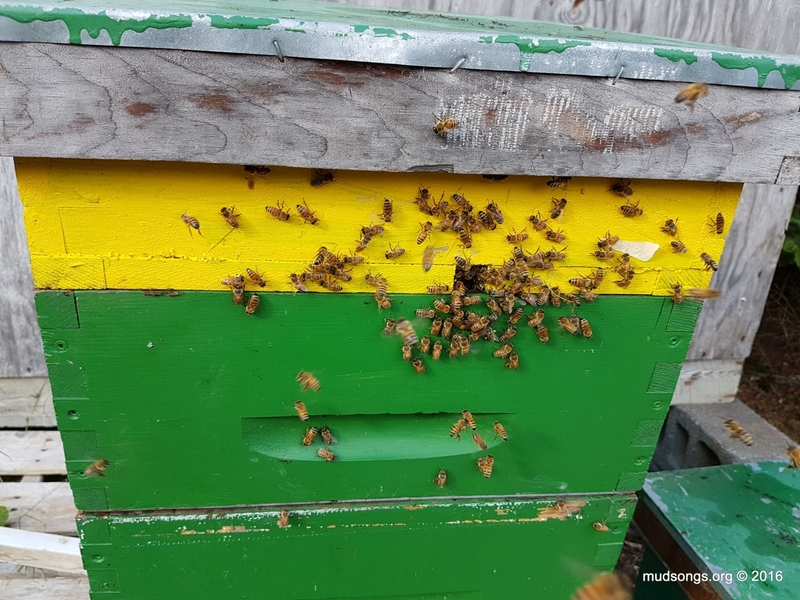 Speaking of messing up their business, yesterday after I did the full inspection (and added the stolen brood to a nuc) and the bees resettled into the hive, they were coming and going from every entrance of the hive. Still favouring the top entrance but using both of the holes in the supers as well as the bottom entrance. I’m curious to see if they continue to use all the holes and entrances or if it was just a temporary thing. The bees in this hive are extremely docile. Even after I squished several bees while reinstalling the honey supers, they didn’t get defensive in the least. I encountered a few testy guard bees about an hour later, but that’s fine. I don’t blame them. Seeing how I don’t plan to touch them again for the rest of the summer, they be testy as much as they want. I’m sure they won’t bother me if I don’t bother them, and that’s the plan. 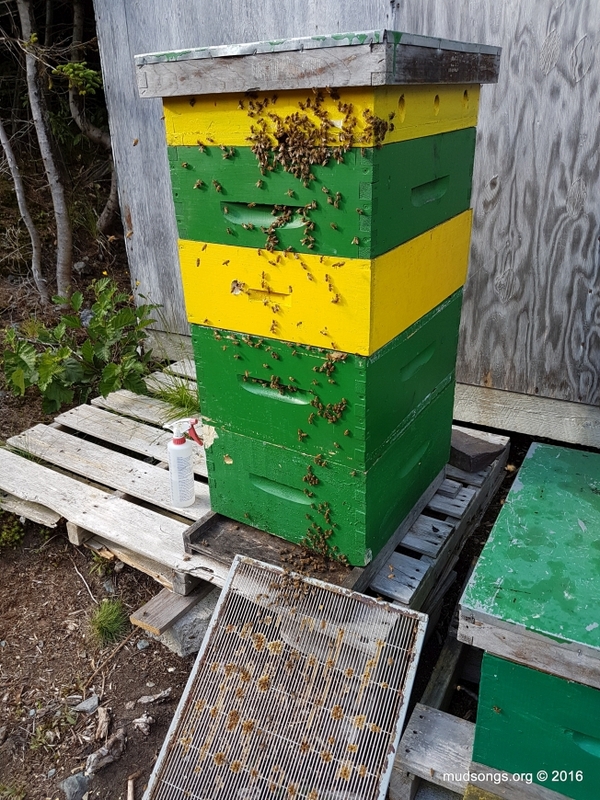 This entry was posted in Behaviour, Drawn Comb, Guard Bees, Honey Frames, Mistakes, Moisture Quilts, Month of July, Ventilation and tagged Stuff That's Good To Know. Bookmark the permalink. If nectar is coming in and foragers are storing it in the top supers, it makes sense to me that they’d prefer the top entrance. Why waste time going in at the bottom and then going up when you can go straight in at the top? More efficient. Bees like being efficient. That makes sense. I’m curious to see if they continue to use the top entrance (above the green honey super) or if they’ll switch to the hole in the new yellow super (which only has drawn comb). The quickest route to the yellow super is the hole. Another opinion that I’ve read is the bees will always (though I don’t think they always do anything) — the bees will use whatever entrance is closest to the brood nest. But I’m not sure about that because I reversed the brood nest in this hive a while ago (I can’t remember the exact date) and moved all the brood frames to the bottom of the hive. Yet the bees continued to crowd the top entrance — and they ignored the hole in the bottom deep. Perhaps it would be more accurate to state that the bees follow the queen, wherever her pheromones are the strongest. So I supposed even if I moved most of the brood to the bottom of the hive, the queen would go up to lay eggs (which is exactly the purpose of reversing), and so my bees continued to use the top entrance. 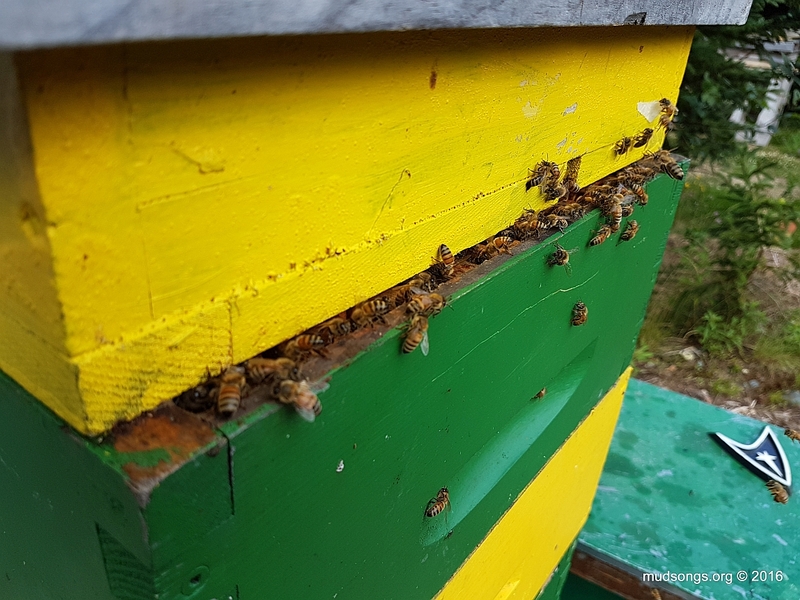 Yet another opinion I read is that the queen favours the bottom of the hive during the height of the honey flow (which is happening right now). Therefore, if the bees are following the queen, they should be using the bottom entrance. And… maybe they’re just starting to do that now. But it also makes sense that the foragers would use whatever entrance is closed to the honey supers (or wherever they’re storing nectar). This is an excellent example of how easily speculation leads to… madness. I’ve become one of those beekeepers who doesn’t know how to leave well enough alone. Damn. I’ve also been reading through my 1947 edition of The ABC and XYX of Bee Culture about surface (or external) signs that a colony may be preparing to swarm. Because really that’s all I care about. As long as the bees aren’t ready to swarm, they can do whatever they want. I love the time of year when I’m confident the bees aren’t likely to swarm — so I can just keep my stupid face out of their business and let them make honey and prepare for winter. As far as I can tell, none of my colonies are preparing to swarm. Unless some foolishness takes over my brain, my plan for this colony is to leave it alone until September. Not touch a thing. The hive has a medium super on top that is quickly filling with nectar. (The last time I checked the honey super a little over 10 days ago, it was light and dry inside. Now it seems to be heavy with bees and nectar.) It also has a new empty super with drawn comb to work on. That should give them plenty of room to make more honey, and plenty of room for any extra brood to removed themselves from the brood chamber so the queen doesn’t get too crowded. In theory, everything should work out just fine. Until I start poking around where I shouldn’t. 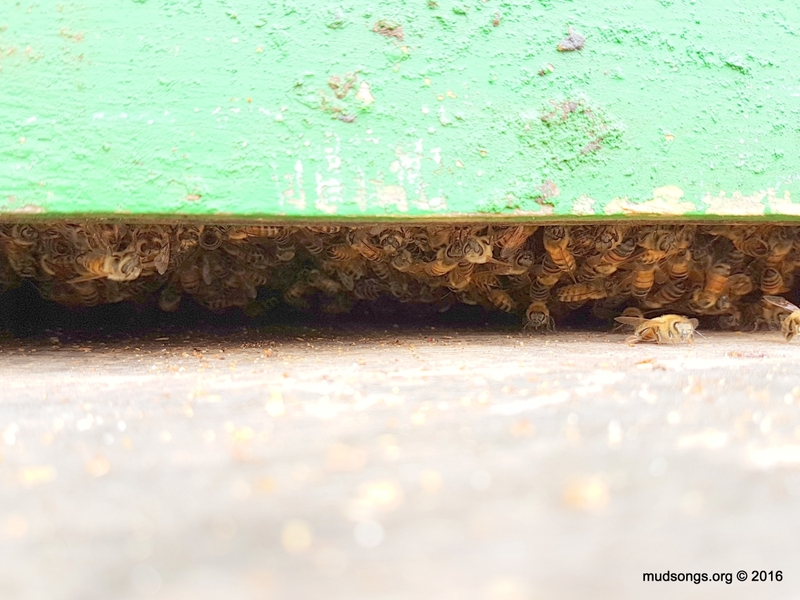 I just added an update, a photo of nurse bees hanging off frames in the bottom of the hive. Was going to suggest you do a varroa treatment before September, but then remembered you don’t have varroa. Jealous. It’s reached Australia now and they’re trying to stop it spreading but they’ll be lucky if they succeed. Your government are playing with fire by allowing bee imports.